RF wireless backlit handset that is activated by touch. DC lift motors provide quiet powerful operation; Zero gravity one touch setting and one touch flat. Dual three speed massagers, one for the back and one for the legs. 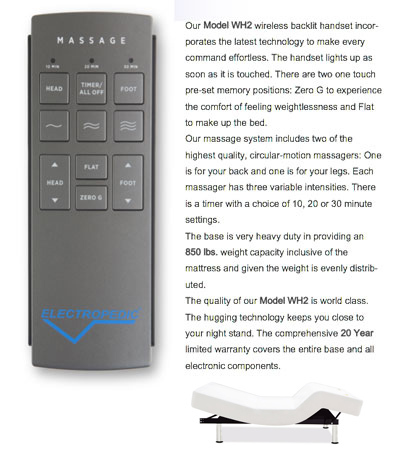 Massage is controlled by a timer that can be adjusted to your choice of three settings; 10, 20 or 30 minutes. Battery backup. 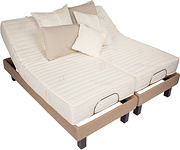 850 pound weight capacity inclusive of mattress. Locking casters. All standard sizes.